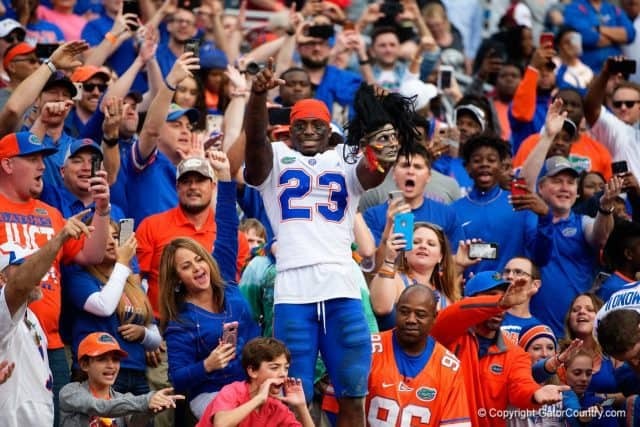 Florida Gators defensive back Chauncey Gardner-Johnson (23) as the Florida Gators celebrate a 41-14 win over the Florida State Seminoles at Doak Campbell Stadium in Tallahassee, Florida. November 24th, 2018. Gator Country photo by David Bowie. When talking about the Florida Gators 2018 season one theme is likely going to continuously come-up…offense. The offense finally broke out of their eight-year slump and became the focal point of a vastly improved 10-win team. 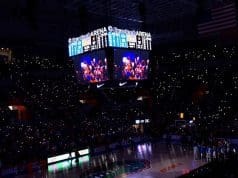 However, it was through some very impressive defensive performances that the Florida Gators were able to capitalize on en route to the SEC’s second-best road defense and sixth-ranked defense overall. 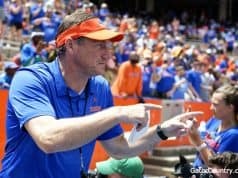 If you followed along to these articles all 14 times this season, you saw the highs and the lows of the Gators on offense and defense; including areas where they improved, areas they struggled, and frankly, a blank canvas that was painted throughout the season that sometimes looked unattractive or confusing, but ended in a beautiful work of art, including ending the last 199:41 minutes of the season on a 166-39 blowout. How did the Gators fare on defense this year? Where did they improve (and struggle)? How did Todd Grantham help mold the Gators defense into an explosive, aggressive defense? The Gators ranked 20th in scoring defense (20 points allowed per game) allowing 15.9 points per game in wins and 33.7 points in losses. The Gators ranked 13th in the country in scoring defense on the road (19.8 points per game), while ranking 36th in home games (20.1 points per game). The Gators ranked 65th in rush defense, allowing 162.54 yards per game and allowing 237.67 yards per game in losses. On the other hand, they ranked 13th in the country in pass defense, allowing just 180.8 yards per game, despite losing their number one cornerback in the second game of the season. They also ranked 24th in the country with 14 interceptions and 16th in the country in lowest pass completion rate – both big increases from the 2017 season. The Gators ranked 19th in the country with 37 sacks, which was a drastic improvement over the 79th ranked team in 2017 with just 23 sacks. They ranked 38th in the country with 86 tackles for loss for 323 yards, which again is a big improvement over the 72 for 235 yards they had in 2017. They forced 11 fumbles in 2018, despite forcing just three in 2017. They recovered 12 of the 16 fumbles that happened on the season (including special teams), which at a 75% rate was the 8th best in the country. The Gators allowed a 37.44% third down conversion rate, which was up from 33.09% in 2017. 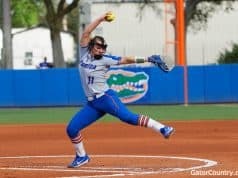 In games, the Gators won they allowed just a 30% conversion rate and in losses, it jumped up to 62.22%, which was 128th in the country. The Gators also struggled in red zone defense, ranking 116th, allowing opponents to score 90.63% of the time, which grew from 82.86% of the time in 2017 and 71.79% of the time in 2016. Jachai Polite ranked 8th in the country with 11 sacks for 55 yards. He also ranked 21st in the country in tackles for loss with 17.5 for 69 yards. Chauncey Gardner-Johnson led the team with four interceptions and ranked 15th in the country in interception return yardage with 110 and was tied for 1st in the country with two interception touchdowns. Jachai Polite ranked 1st in the country in forced fumbles with six. The Gators ranked 13th in the country forcing a turnover on 2.99% of defensive plays. Opposing quarterbacks only had a 112.41 quarterback rating against the Gators defense, which ranked 17th in the country.